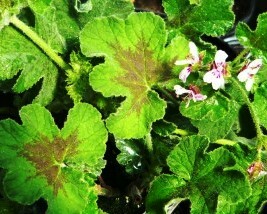 Chocolate Mint Scented Geranium (p. quercifolium 'chocolate mintt') Velvety dark green leaves have a peppermint patty scent and develop an attractive dark purple/brown zonal patch during cool weather. Small pale pink flowers when in bloom. Large rambling plant needs lots of growing space. Can be used for culinary purposes. Perennial zones 10-11+. Live starter plant in 3 inch container.